First of all...check angle C. Is it really 58 degrees? Redraw just the triangle on the ground by itself. The 11 degrees is not part of this triangle. Ok so you need DC. We can assume that angle DCA is 90 degrees. What do you know about triangle DCA? All you know at this stage is that it is right-angled and one of the angles is 11 degrees. It would be useful to know more info about triangle DCA. Do you know the length of CA - that would be useful! Can you find the length of CA using the triangle on the ground? Yes you can (I assume you've learnt the sine rule). 2. Since CA is also a side of the vertical triangle, use some basic trig to find DC. Give it a go and come back if you have trouble. Last edited by Debsta; Sep 18th 2018 at 03:01 PM. 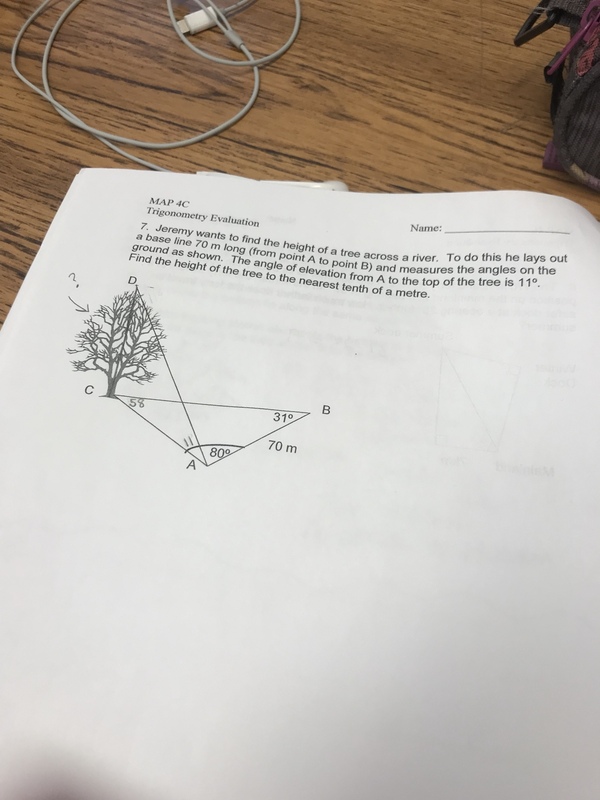 Need help solving grade 12 trig word problem. Lower Grade Level for Trig and Algebra ?